Sunset Boulevard is the framed home of movie stars and entertainment industry moguls. 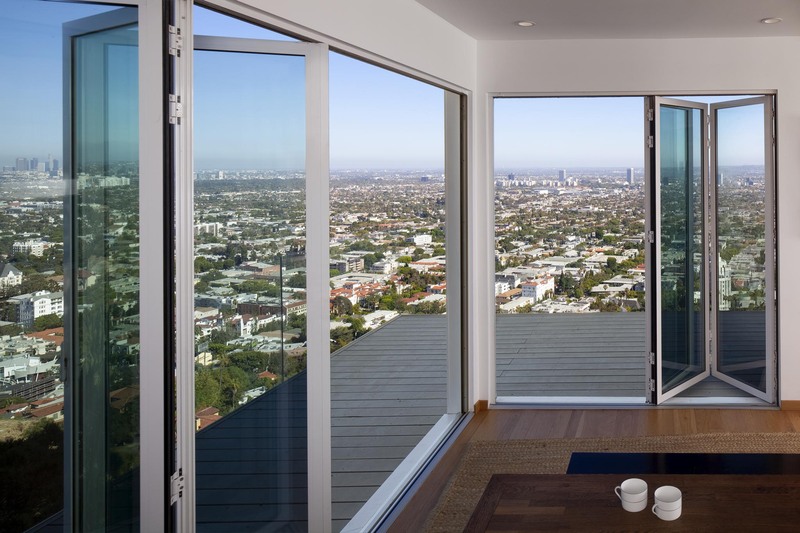 Running west from Hollywood into the hills overlooking Los Angeles, the homes on Sunset enjoy stunning views of the city. Many of the houses are quite old by Los Angeles standards, leading homeowners to renovate and make improvements. 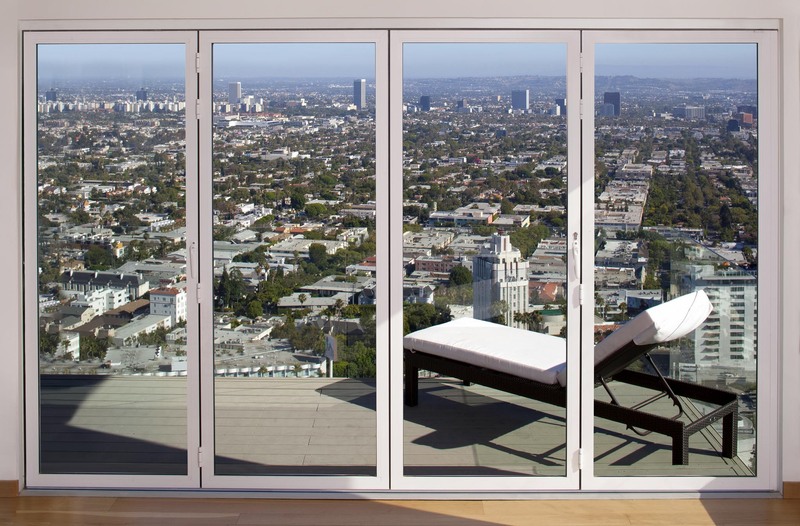 With the warm climate and panoramic vistas readily available, NanaWall is a natural fit for many remodeling projects. "Maximizing the views was obviously a critical aspect of our design," recalls Vianny Boutry, who designed the renovation of this Hollywood home. Principal of Atelier Vianny Boutry, the architect recognized the challenges he faced delivering on his client's desires: An existing solid wall failed to maximize enjoyment of the views, even in spite of the large windows and French doors it contained. Also, creating a terrace or deck of any real size or value would have been nearly impossible. "NanaWall's SL45 system allows my client to feel like he is outdoors while inside the house." 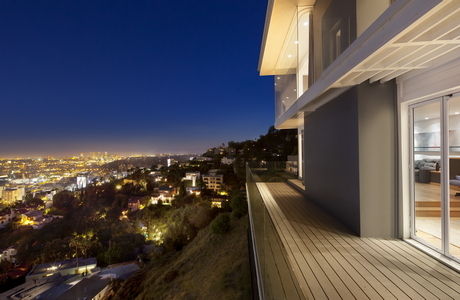 “The deck area in front of the house is limited, because of the steep slope," says Boutry, in reference to the location on the incline of the Hollywood steep outcroppings. 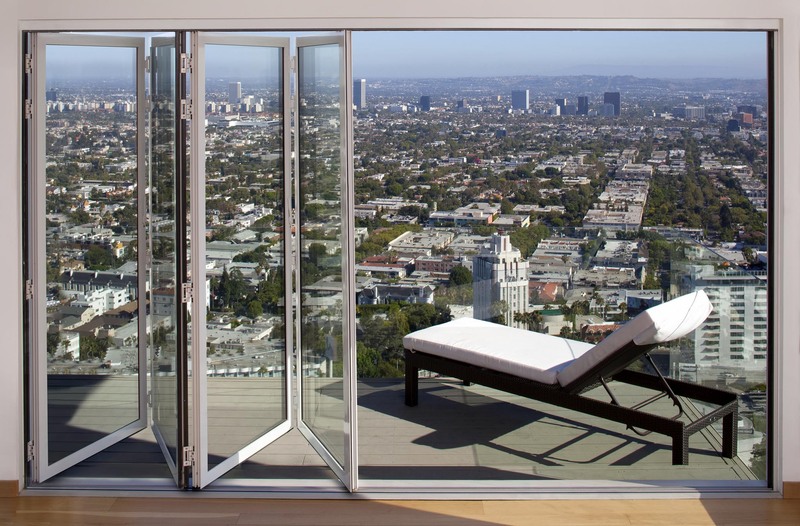 Boutry decided after brief contemplation to recommend 11 panels of NanaWall's SL45 Aluminum Framed Folding System. 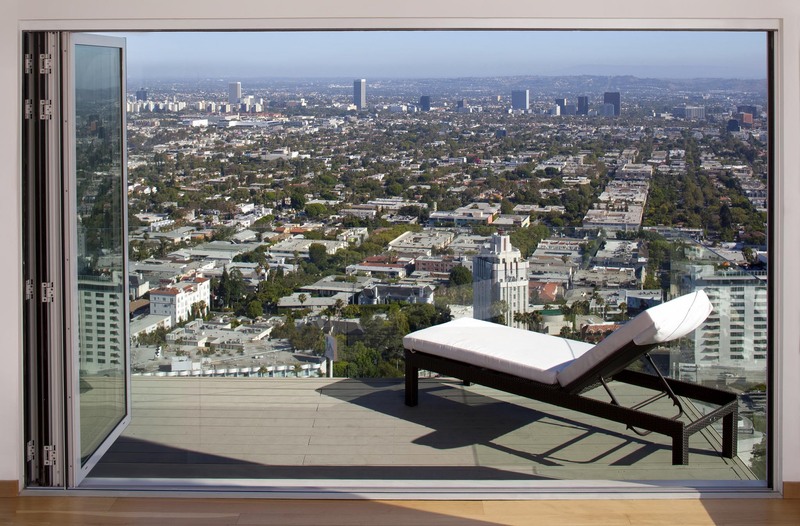 The glass doors would occupy the three openings his design would create, a vast opening to the views. The NanaWall system capitalized on the position of the home, its surrounding scenery and cooling breezes to the interior. The living room is protected by NanaWall's superior engineering during rare inclement weather, and transformed into a covered deck when opened wide. "Truly, there was no other type of door system considered," says Boutry. 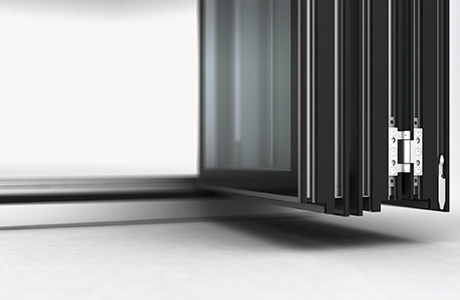 "Open or closed, the NanaWall doors are the perfect solution." "If the house were new," notes Boutry, "we might have weighed using a sliding door system that retracts inside a wall." NanaWall, equally well suited to new construction, in this instance provided an ideal solution for a remodel. 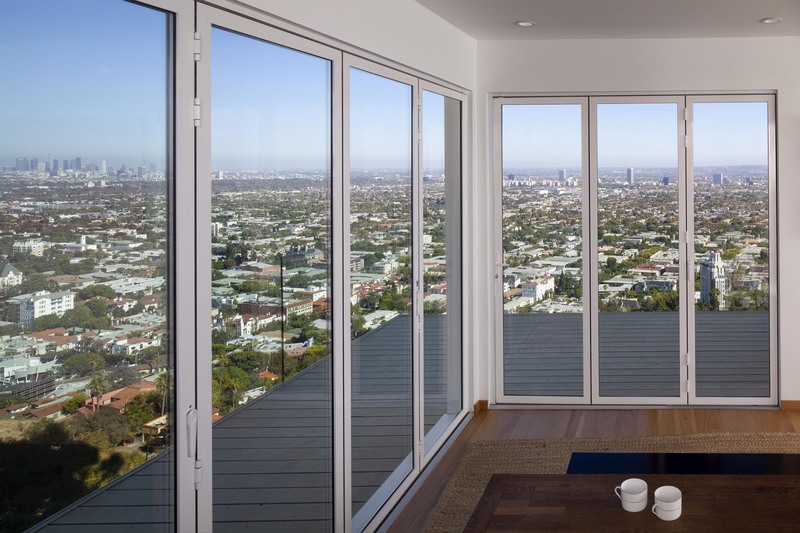 The panels do not entirely disappear, but they easily slide and fold in pairs to one side, leaving the view essentially unobstructed. Boutry also notes that the NanaWall systems’ ability to effectively disappear, creating a seamless transition from indoor to outdoor – as well as the system's smooth and easy operation – gave his client further weight to the decision. "We take pride in integrating our client requests for minimalism and simplicity with the site conditions," says Boutry. 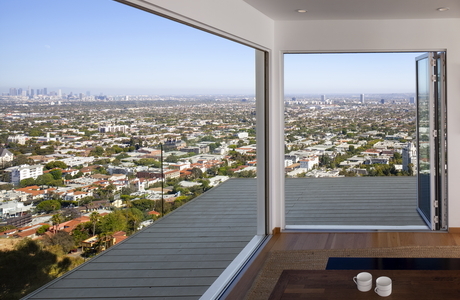 Plus, NanaWall more than made up for the home's limited available space for a deck, he adds: "NanaWall's SL45 system allows my client to feel like he is outdoors while inside the house." Boutry continues, adding that NanaWall also “delivers incredible views” from the house when they are open, while “perfectly protecting the interior against the elements when closed – wind, rain, and noise, too.” When specified with acoustically rated glass, NanaWall offers a high-performing level of noise attenuation, according to product engineers. Both Boutry and his client also feel confident in the security that NanaWall's construction affords. The stainless-steel shoots, bolts and door hardware offer significant protection against intruders as well as weather. "The owner is very satisfied with the system," concludes Boutry.